Whats the Legal Barrel Length of Shotguns and Rifles? Simply put, on the whole, a rifle barrel should be no less than 16" and a shotgun barrel should be no less than 18". 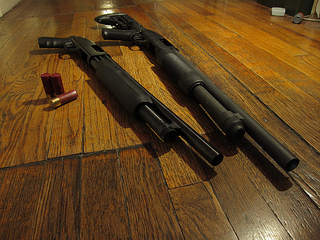 While the overall gun length for either a rifle or a shotgun has to be 26" according to the ATF, paying extra for an exception can make a difference. Even though black powder guns don't have this limitation, guns that fire "smokeless powder" do have to adhere to ATF and federal guidelines. That's why shotguns like the modern Mossberg 500 and 600 series riot shotguns will measure out to these specifications. While sawing off a double barreled shotgun or cutting a M1A1 to lengths as short as 12" is possible to make them a lot more cancelable, especially under a dustcoat, the government says that a short shotgun or short rifle isn't legal unless you apply for a specific license. It is possible to apply for a license for a short rifle or short shotgun with the ATF (Bureau of Alcohol, Tobacco and Firearms). The fee is either $200 or $5 depending on circumstances and the way the gun is manufactured, but owning a gun shorter than the "standard" legal limits is possible. For a gun manufacturer, adhering to the legal limits is mandatory and if you find a shortened gun at a gun show or even at a private sale, be aware of your rights and the applicable laws. Thanks to Arielny2011 for use of the cc image.